Insisting on the Best Result | Robert S. Minch, D.D.S., P.A. I love to cook and bake – seconded by the fact that I love to eat! In addition to creating beautiful smiles for my patients,over the years I have also become known for making delicious cakes and pies from scratch. Members of my family and staff have come to look forward to their own cake that I make for their birthday. 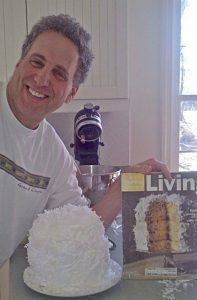 My favorite cake to make is the one I do for my sister Sandy- a 6 layer coconut cream cake with white, marshmallow icing. This cake (that I got from Martha Stewart) has been a winter tradition for over 15 years. Well I don’t know what you do during a snowstorm when you are socked in with 2 feet of snow blocking your car from ever getting to the road……I cook. Over the weekend, while the snow was coming down and the local news stations were showing their reporters in the snowstorm to confirm that it was indeed cold and snowy, I made meatloaf, 2 soups, a pot roast and…… my sisters’s 6 layer cake. As you might imagine, it is a process that takes 2 days and many steps. When I got to the last step, spreading the marshmallow icing made from scratch, I could tell immediately that something was wrong. The icing was grainy and it didn’t spread the way it should. Without hesitation (and a loud groan) I scraped off the icing,thought about what could have gone wrong and immediately set about to remake the icing. Twenty minutes later I re-iced the cake (much better this time) and ended up with a beautuful cake. I could have used the original icing – it would have sufficed but it would not have been the best that it could be. It got me to thinking about the benefits of experience and wisdom to know when a certain step doesn’t go according to plan and the necessity of immediate action. In today’s culture of large corporations and the disappearance of true personal service, it seems more common to lower the bar when things don’t go right and to accept mediocrity. This mentality is not acceptable in either excellent dentistry or delicious baking. Making beautiful teeth (with either porcelain veneers or bonding) is a lot like baking- it starts with a good plan (recipe) and demands attention to detail for every step. And yet, even with this attention to detail, things don’t always go according to plan. This is where demanding no less than excellence comes in- whether it is icing for a cake that is not the right consistency or a set of veneers that come back from the lab looking less dazzling than they should, the result should be the same : step back, assess what went wrong and set out immediately to get the desired result. Only in this way are you assured of having the desired perfect smile or…. a delicious birthday cake! So, when you are ready to make a major change in your teeth, be it to create that “Hollywood smile” or to get your bite more comfortable and to be able to chew better, make sure your dentist has that attention to detail. Ask to see some work they have done on other patients and ask specifically what they do to ensure a predictable, dependable exquisite result. They don’t have to be a good baker……. but it sure does help! !